Back in the 1980’s I was a teenage air cadet and mildly obsessed with anything aeronautical, and particularly obsessed with anything Vulcan related. 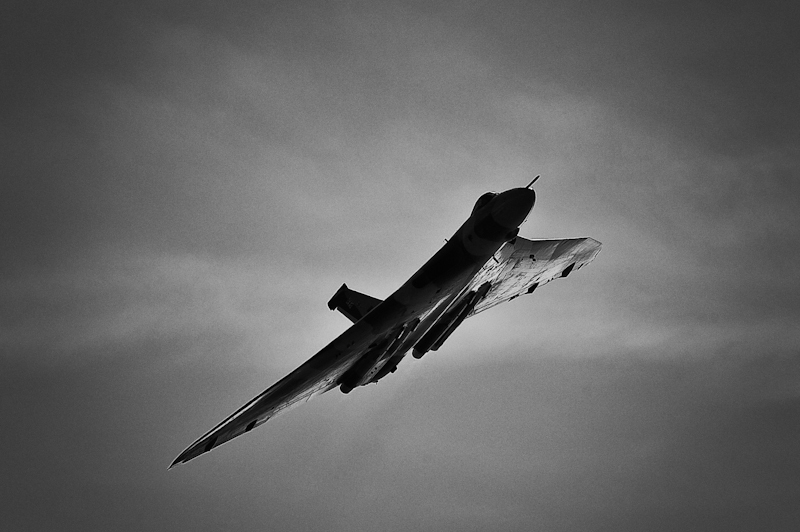 On my bedroom wall was a large poster of XH558, the last surviving flying Vulcan, which was at the time the RAF’s Vulcan Display Team The highlight of my visits to the Finningley Airshows were seeing this mighty flying triangle do it’s display. I last saw it fly at the Barton Airshow in 1989, were it was the last aircraft on the schedule, and late. The crowds were queuing in their cars heading to the exit and then with a mighty roar, boooosh, the Vulcan was here. The traffic stopped, the ground shook and heads turned skywards as this huge aluminum triangle zipped around the sky like a fighter, shaking our insides and deafening us as it turned away from the crowd on full power. The RAF took it out of service in 1993 when it ran out of hours, and it ended up in private hands at Bruntingthorpe, undergoing a hugely expense and seemingly never-ending restoration. I went to see it in the latter stages of its restoration, and was as excited as I was when I was 14 at the prospect of it taking to the air again. Then fate took over. It was booked to appear at the 2008 Cosford Airshow so I went along only for it to fail at Bruntingthorpe and not turn up. I had tickets for the 2008 RIAT, and was sat in a restaurant in nearby Gloucester the night before, looking forward to seeing it the following day, only to get a call from a friend who was already at Fairford saying that the entire show had been called off due to the Biblical amounts of rain. The following two years were taken up with work and the arrival of my young daughter but I always visited my local airshow at Southport, and yet they never booked the Vulcan. Finally though in 2011 the planets were in alignment and the Vulcan was booked, and I had a free weekend. Actually, I didn’t realise that for some reason the show had been moved from its normally rainy September date to one in July, until the week before. CANCEL EVERYTHING, I’M OFF TO SOUTHPORT. The day was uncharacteristically nice, and like those 1980’s show, I was here with my dad, as I thought that the cacophony of noise would probably not be an ideal place to bring the baby for her afternoon nap. The sky was blue and the sun was shining, two things I’d not come across at an airshow since 1989. Now the beauty of Southport is that if you get there early enough you can park on the beach, and watch from the comfort of your car if you wish, or retire to it in the likely event of rain, but, no, the sun stayed out. So after an appetiser of the gorgeous Hawker Hunter (one of the best looking aeroplanes ever built, and another favourite), the main course arrived. Looking to the North, a large flat black silhouette pounded down the coast at low level, trailing a black dirty exhaust. It was here. Never mind the photos urged my dad, just enjoy the show. He was right as dad’s always are, but how could I not record the second coming of the aircraft that inspired me to go into engineering as a professions and aviation as a career? The display was as memorable as I’d remembered it, the Vulcan was still being thrown around like a giant fighter, although with perhaps not as much vigour as I recall it from the rainy Finningley shows of the late 80’s. And all too soon it was over. Despite being limited by the focal length of the Nikon 70-300VR I use, I managed to get a few good photos out of the display, but I think this is the one that for me epitomises the grace and power of this magnificent aircraft. *Roy Chadwick was Avro’s Chief Designer and responsible for designing the Vulcan. A brilliant engineer, he also designed the Lancaster. Sadly, he didn’t actually see his greatest aircraft fly, as he was killed in an air crash before the designs were finished. Interestingly, the canteen at BAE Systems Chadderton site, where the Vulcan airframes and wings were made, is named Chadwicks in his memory. Next Post #209 – Tornado!